The idiosyncratic color shift of the title sequence in Nagisa Oshima’s trenchant and acerbic coming-of-age tale, Boy provides an incisive metaphor for the imbalanced natural order that lies beneath the veneer of the modernized, national recovery of post-occupation Japanese society, as a seemingly de-saturated, black and white Japanese flag prominently placed in the center of the widescreen rigidly confines the visual elements of the screen to within an inner subframe twice bounded by the demarcation of the black sun circle within the center of the white flag. The expectation of the seeming monochromatic aesthetic represented by an anemic national flag is then subverted by the superimposition of bold red calligraphy that culminates with a portrait of the film’s titular, innocent-faced Boy (Abe Tetsuo), a defacement that also foretells the intrinsic cruelty and violence that the Boy suffers at the hands of his aimless, self-absorbed family. This notion of subverted expectation continues with the establishing shot of the Boy briefly, inexplicably crying while precariously – and symbolically – standing at the edge of a heavily trafficked street – the pedestrian sidewalk having been demolished as part of a nearby construction site – in an apparent, perhaps frustrated, wait for an opportunity to cross the busy intersection. A subsequent episode then illustrates the insidious context of the elaborate confidence game behind this curious posture as the Boy’s stepmother (Koyama Akiko) walks alongside a stream of cars before picking a suitable (or more appropriately, gullible) mark and rushing headlong into the side of the automobile with an audible slap on the vehicle’s body before falling away, seemingly unconscious, into the nearby curb, the Boy dutifully falling to the ground in feigned trauma over the severe “accident”, followed immediately on cue by the even more guilt-inducing pre-scripted plot of the father (Fumio Watanabe) rushing from across the street to attend to his (common law) wife’s injuries while simultaneously holding a flag waving baby (Tsuyoshi Kinoshita) in his arms. The often-played scenario would then bring them to a nearby clinic where the prospect of sustaining job-threatening, long recovery injuries invariably lead to the father’s increasingly aggressive tone and threats of police involvement in a ruse to extort money from the unsuspecting driver in exchange for a waiver of liability for the incident. Performing their scam from town to town along the Sea of Japan, the Boy begins to take increasing responsibility for “working” the faked accidents, assuming the role of victim to his stepmother’s outraged, panic-stricken parent, until a fateful encounter with a young girl in the northernmost city of Hokkaido – the edge of Japan – drives the Boy to profound confusion and despair over his own culpability and guilt. 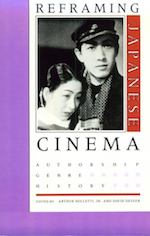 In returning to the confidence games of his earlier films, most notably A Town of Love and Hope and Cruel Story of Youth, Oshima expounds on his recurring themes of rootless materialism, alienation, and victimization that were endemic within the culture of Japanese postwar society. Shooting the characters predominantly in medium and long shots from the peripheral margins of the camera frame, Oshima reflects, not only the family’s marginalization within contemporary society, but also the moral decentralization and intrinsic rupture of the very notion of Japanese tradition – and in particular, the support system of the extended family – as the Boy is not only uprooted from a proper education and his hometown because of the family’s evasive itinerancy, but also his biological mother (who may or may not be terminally ill) and his grandmother (whose emotional attachment has been psychologically manipulated by his father through insensitive comments about the Boy’s abandonment and unwantedness). This recurring interrelation – and transposition – between emotional and economic extortion is further reflected in the stepmother’s recurring attempts to ingratiate herself into the Boy’s trust: first, through the boy’s impetuous demand for a baseball cap perched atop a life-sized robot as an inducement for finding the courage to play his new role of the victim for the scam, then subsequently, for a calendar watch in exchange for his silence over her intentionally skipped appointment with an abortionist. In both occasions, the extorted object becomes not only a surrogate for human affection, but also the transactional currency of all familial intimacy, where communication is reduced to the silent, coded signals of identifying the next confidence mark, and deciding on the proper amount of money to be extorted that will meet the family’s short-term financial needs (note the father and son’s complicit discussion in the men’s room of a restaurant planning the details of the Boy’s role in their next scam). Placed within the context of the crying Boy pacing the edge of the excavated sidewalk that opens the film – where the ground has literally been removed from under his feet – the introductory image of the confused, alienated, defeated young hero serves as an allusive, reinforcing national sentiment of profound rootlessness and bewilderment over the upended, disposable values of an alien, intraversable modern world of commodified humanity.